The Ohio Human Services Training System is a cooperative effort between the Ohio Department of Job & Family Services (ODJFS), the Ohio Human Services Training System Steering Committee, the Institute for Human Services (I.H.S) and the four (4) Regional Training Centers. Funding for the program is provided by the Ohio Department of Job and Family Services. Strengthen best practice in adult protective services through comprehensive skill development, collaboration, and advocacy. A dynamic training system that develops professionals who promote safety and well-being for Ohio’s older adults at risk of abuse, neglect and exploitation. 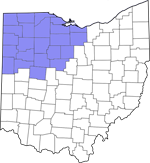 For a complete listing of the counties that the OHSTS Northwest Region serves, along with their corresponding liaisons, click the button below. For general facts regarding OHSTS, how it is comprised, and a listing of what is to be expected of workshops and overall training, click the button below.